As promised, more love, more giveaways! 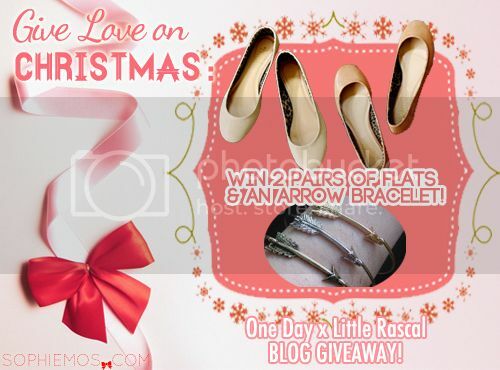 Next up, I’m giving away not one but TWO pairs of Darla Classic Flats (colors of your choice) & an awesome arrow bracelet (color of your choice) from Little Rascal! Read more on how to join! 1. Like One Day AND Little Rascal on Facebook. 2. Follow my blog on Tumblr. +5, post this as your Facebook status: “OMG! I want to win 2 pairs of cute flats & an awesome bracelet from @Little Rascal at www.sophiemos.com! Check @One Day to win amazing prizes!” Make sure you tag One Day AND Little Rascal. Also make sure your account is set on public, so that I can verify it. Contest period is until January 3, 2012, Thursday, 11:59 pm. Winners will be chosen via random.org and will announced on my blog/twitter. Best of luck everyone! 1st Anniversary Big Blog Giveaway!!! One Day x Pustura Manila Blog Giveaway!